I have a history of buying cheap hardware out of necessity. This has not changed in more than ten years. I wish it was different; but scrimping and saving and buying cheaper, off-brand is the only way I can afford to do things. That said, I am lucky be able to afford what I can afford, it is definitely more than some who are less fortunate. I have a triple monitor setup, which some might call an unnecessary luxury; but with my eyesight being what it is more real estate means being better able to both fit a reasonable amount of things on the screens at a reasonable visibility. Each of the three displays is 27″ and capable of a resolution of 2560×1440 at 60Hz. They are all also ‘cheap’ (relatively speaking) Korean knock-off imports- brands such as PCBANK, Crossover and DGM- the last of which I have at least come across before, in the form of the cheap TFT monitors referred to in the post linked at the start. At least they have a track record! PCBANK – The only one I bought new. Makes an audible noise when displaying white or mostly white (eg a a mostly text web page, such as Wikipedia). Also occasionally displays a distorted image for half a second before coming to its senses. In addition, the transformer for the PCBANK or DGM monitor developed a fault which made my speakers screech like a banshee requiring me to take the highly-technical step of moving the transformer further away. Then it started buzzing itself, and needed replaced. Those transformers are beasts, incidentally- 24V 5A or 120W. 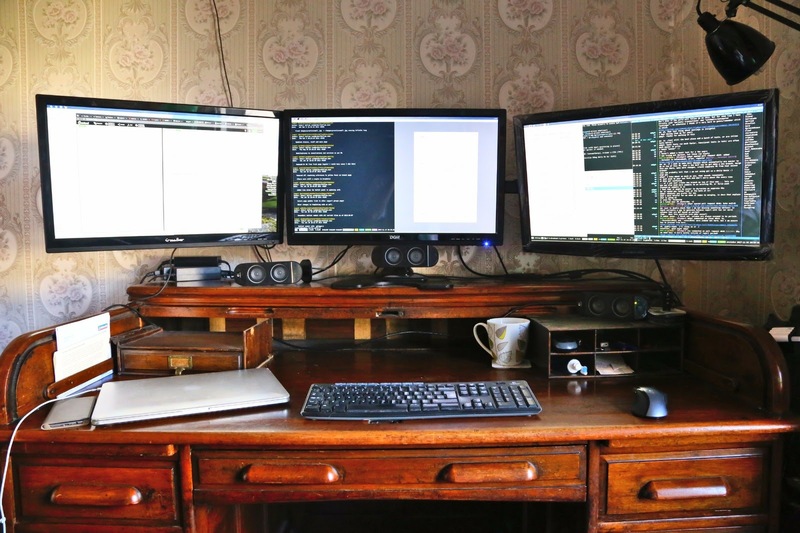 These faults range from irritating to intolerable, but I reckon that if I had three monitors from reputable manufacturers at a commensurate price, I wouldn’t have the same issue with malfunctions.